Flooding is the disaster that just keeps on taking. There are three main phases of water damage cleanup, which during each phase, your home or commercial property is continually susceptible to further water damage. These phases include removal of the floodwater, drying out the excess moisture, and finally restoring the items in your home or commercial property that were damaged as a result of the flooding. This last phase is of critical importance because it involves the restoration of your valuable, often expensive, furniture and other items of that nature. At Design Builders in the Henderson area, our restoration professionals are experienced in all types of water damage, whether it be home or commercial, minor or serious, we are here to help! Below are a few important tips regarding saving your furniture after a flood. 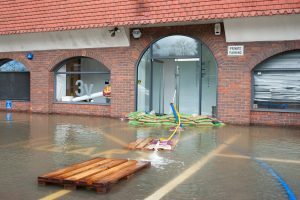 One of the most important aspects of water damage restoration is acting quickly. Every moment you wait to get the help you need, the damage caused by the water or flooding is increasing. Nonetheless, your safety still needs to be your number one priority. That means you should never just rush into the scene of a flood to begin cleaning it up before assessing the potential dangers. For instance, your property could have been structurally damaged by the flood or the floodwater might be contaminated and be carrying harmful bacteria. Before you do a single thing to clean up the damage, you’ll want to document everything that happened by taking photos. This will be a huge help to you when it comes to filing your insurance claim. The better and more thorough documentation you have for your insurance company the more likely you will be to receive the highest level of compensation from your insurance company. Water damage cleanup can get pricey so this should be a high priority for you. If possible, move salvageable furniture to a dry area to begin the drying process. If a piece is too heavy to move, consider placing wood or cement blocks or aluminum foil under the legs to protect it from the wet floor. Doing this may or may not make a significant difference in the end but it certainly can’t hurt. At the end of the day, there are some things that simply can’t be saved due to water damage. It’s important to recognize this at times. However, many people make the mistake of prematurely getting rid of some items that they thought were beyond repair when they actually could have been saved. For instance, our technicians at Design Builders in Henderson have sophisticated, state-of-the-art water restoration technology not just for removing the water from your home but removing the water from any of your furniture and damaged possessions. Thus, don’t make any decisions regarding what to keep or what not to keep after a flood. Let the pros inspect the damage first and determine what can and cannot be restored.